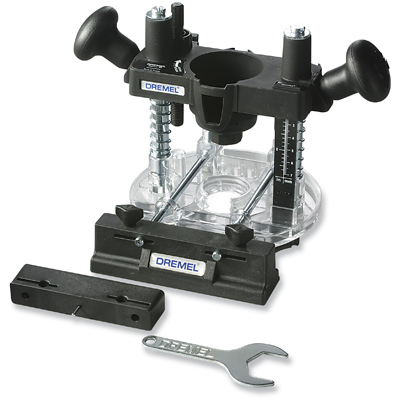 Subject: Any body use a Dremel router? Any body use a Dremel router? I need to counter sink a set of sling swivels into the stock on my Thompson and I was wondering if this little Dremel attachment works? Seems to be better than me cutting out the walnut stock with my pocket knife LOL. Re: Any body use a Dremel router? Did not know they offered one. Pretty cool! I'm a big fan of the company. Customer Service is top-notch. Bosch now owns them, but I haven't seen any change in how they deal with their customers. Just saw a show where they were building fancy banjos. They used one to route in inlay and it seemed to work real slick. They just traced the inlay set the depth to the thickness and went to town. Made it look easy. I have a older version that I used to rout flowers and cupbord doors. It worked very good. If you are going to use this on a rounded surface, it will be verry trickey. Never tried it but I've kinda been thinking about one of those too. Seems like a good idea if it really works. Got it today. Plan to use it to do some work on a rifle stock. I'll let you know how it works.